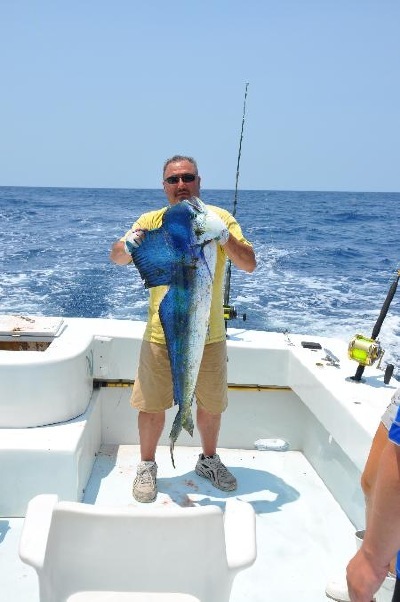 Big Mahi Mahi with a 53 lb citation!! 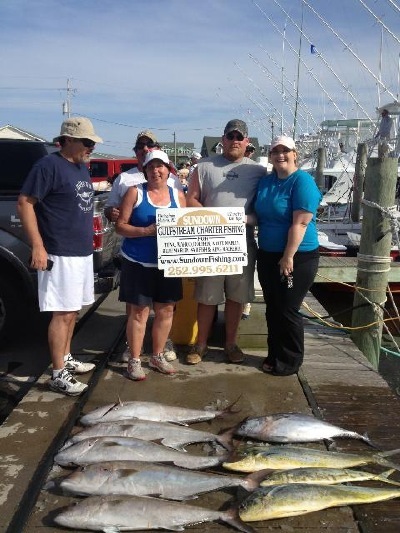 Blackfin Tuna, Yellowfin Tuna and Mahi Mahi Happy party !! What a Birthday Trip 11 citation Black Fin Tuna!! Great Blackfin fishing with a nice Wahoo and Mah Mahi!! Lots of big Gaffers with plenty of fight for this group of young men! Citation Jack Creville on a Jigging rod! 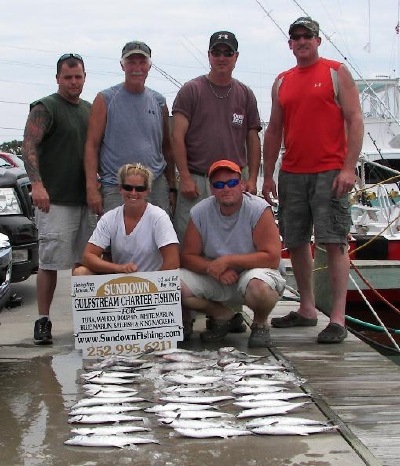 4 CITATION BLACKFIN TUNA'S Great crew beautiful day on the ocean!! Big Gaffers and a nice Blackfin Tuna on a beautiful calm day!! Fun Day with a Make-Up Party lots of cranking! 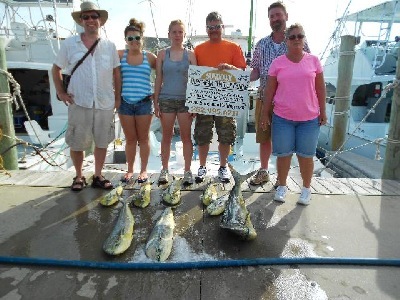 Great Crew Awesome fishing Tuna's Mahi Mahi Wahoo's Sailfish!! 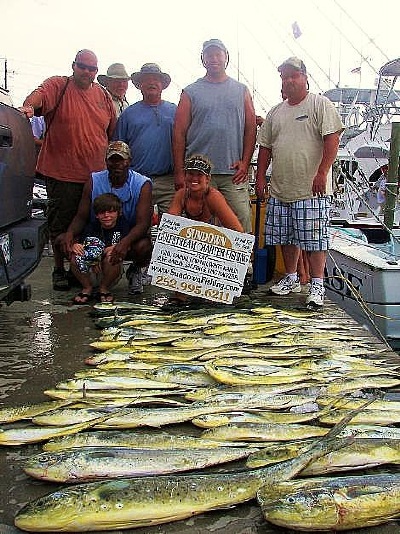 LIMIT OF BIG MAHI-MAHI AND A 36LB CITATION!! 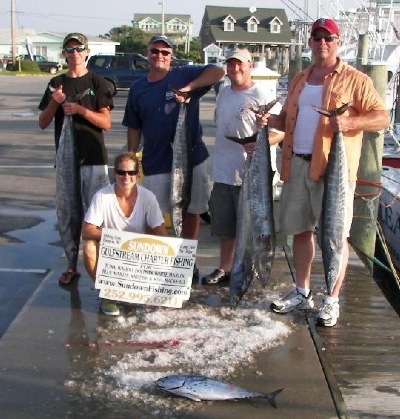 AJ'S and a Blackfin tuna on a calm day! Lots of fun for this two man crew!! 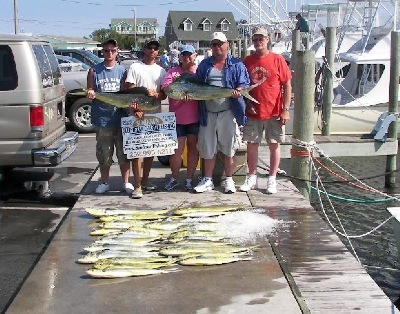 Wahoo's Tuna's Mahi Mahi AJ'S Great day of fishing!! 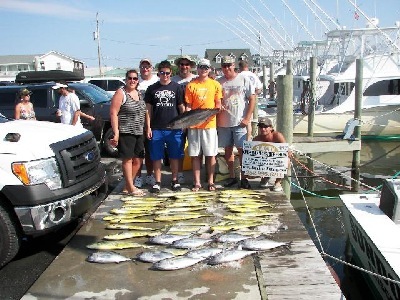 Awesome day of Yellowfin Tuna fishing and bailer Mahi Mahi fishing!!! 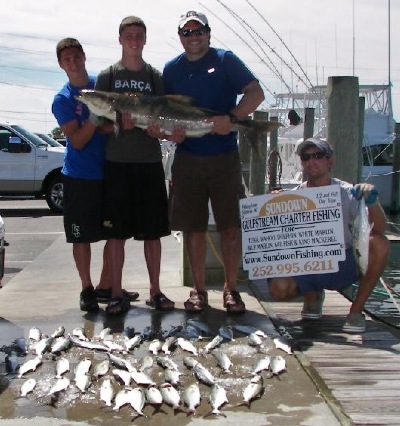 Great day for this young man's first trip offshore!! Great Fishing for Big Spanish on a calm day!!! Nice catch of Wahoo's and big Gaffer Mahi!! Lots of Spanish on a calm day!! Great crew!! Citation Wahoo's and White Marlins!! Pair of Gaffer Dolphin !! Fat Wahoo's and a nice coconut Great crew!! 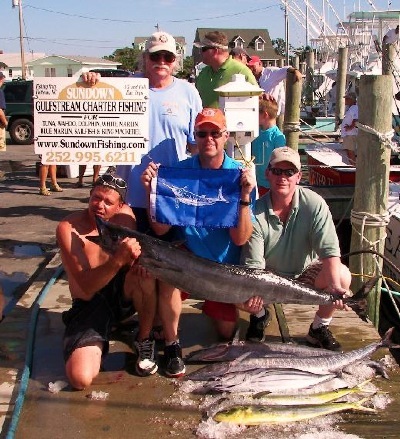 Great Catch Mahi Mahi and Wahoo's!! Fun Family day with happy young men!! 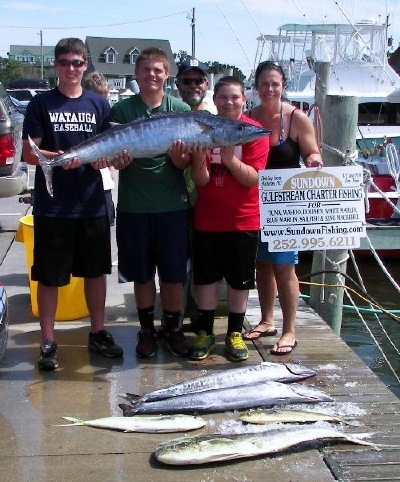 Nice Wahoo's and Mahi Mahi's!! 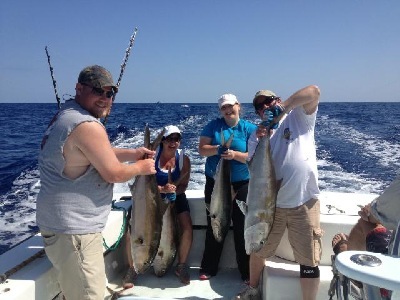 Fun Family day with the AJ'S ,Wahoo and Mahi Mahi!! 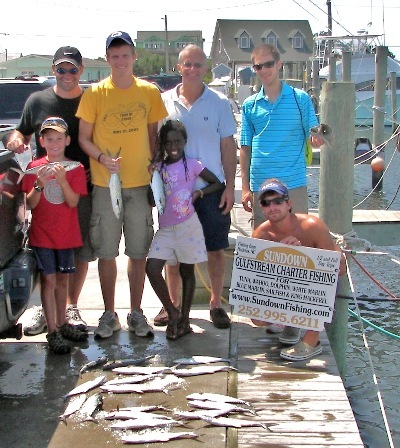 GREAT STICK FISHING FOR BIG TUNA'S!!! Great Makeup crew with a nice wahoo and king plus big gaffer Mahi Mahi!! 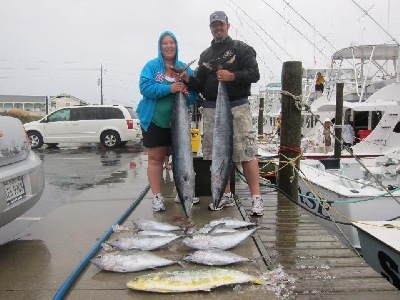 Big tuna and a nice catch of Mahi Mahi on a extreme day what a tough family!!! 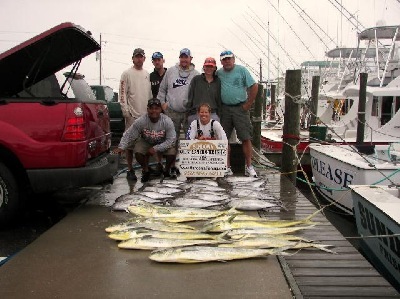 Fat 60 lbs Yellow Fin tuna's and Mahi-Mahi on a very sporty day!! 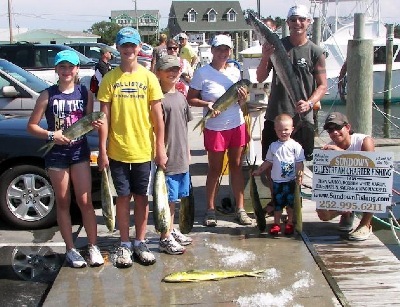 Fun Family day with a nice catch of Mahi-Mahi!! Nice catch of Black Fin Tuna and Mahi Mahi!! Great Fishing before the storm!! 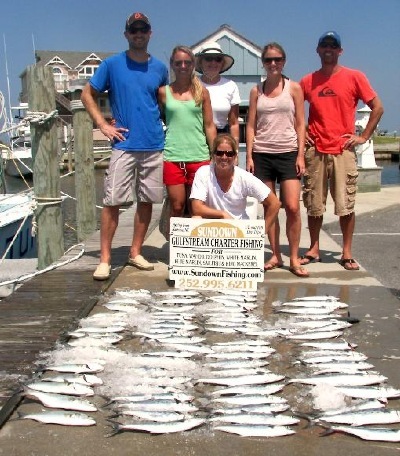 Great crew with a mix of Blackfin Tuna's Triggers and AJ'S!! Great family fun fishing on a pretty day in the stream!!! Nice catch with a great mix Wahoo Tuna and Mahi Mahi!!! Nice Catch of Mahi Mahi and a fat Yellow Fin Tuna!! Fun day of Jigging with a great crew!!! Nice catch of Mahi Mahi!! 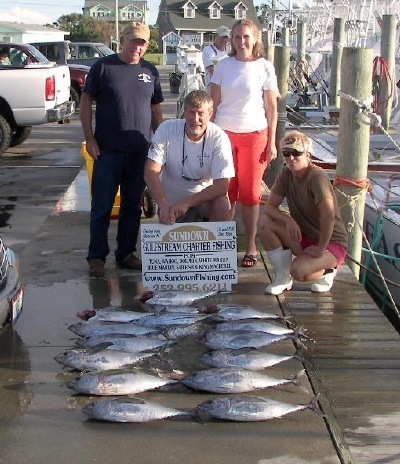 Nice catch of Yellow Fin Tuna!!! 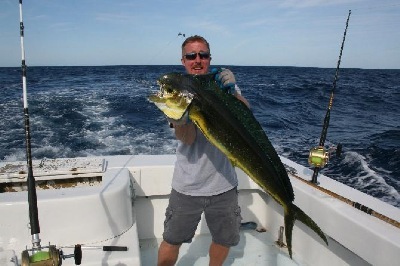 Nice catch of Gaffer Mahi-Mahi!! 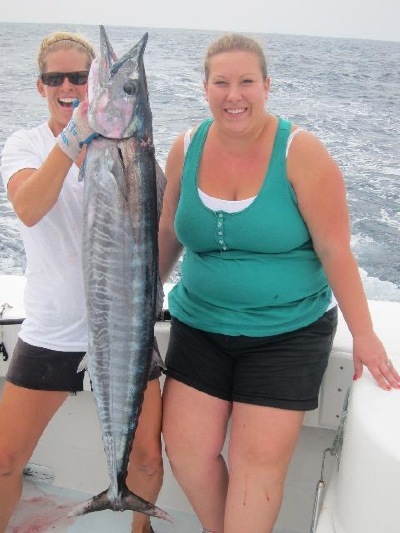 NICE WAHOO AND BIG GAFFER MAHI-MAHI !! PLEASE SEND US YOUR NEW PHOTOS! Lots of big Mahi-Mahi and a WAHOO on a calm !!! Nice catch of Black Fin Tuna !!! 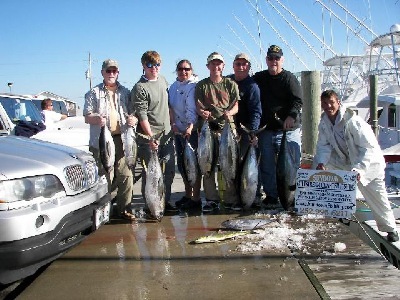 Great crew on a fun day for Wahoo and Blackfin Tuna!! 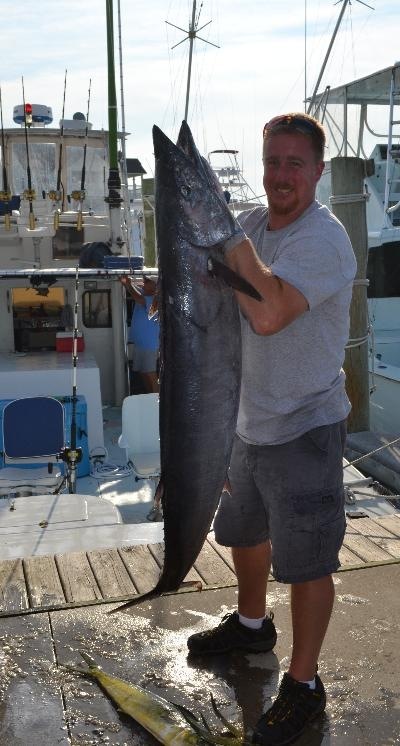 Nice Wahoo ! good job Rebecca! Great Fishing!! Black fin Tuna and Mahi Mahi on a beautiful fall day!! Citation Wahoo 51LBS great crew What a fight!! Good Wahoo fishing with a great group of Firefighters!! Great day of Spanish fishing with light North East winds on a beautiful ocean!!! Wahoo's and Bottom Fish a Great day Offshore!!! Nice Catch of Big Spanish!! 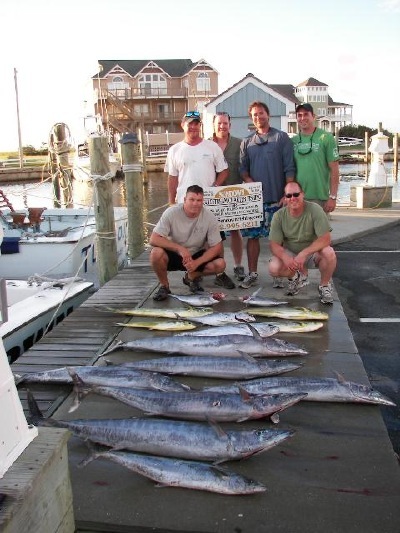 Great Mahi Mahi and Wahoo fishing!!! 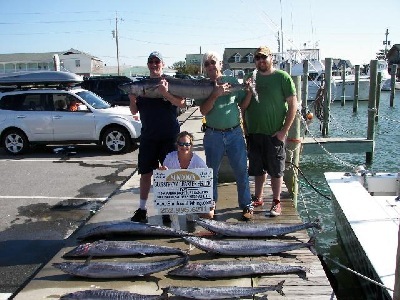 Nice catch of Black Fin Tuna, Wahoo and Mahi Mahi !!! Wahoo's and a catch or Mahi- Mahi!! 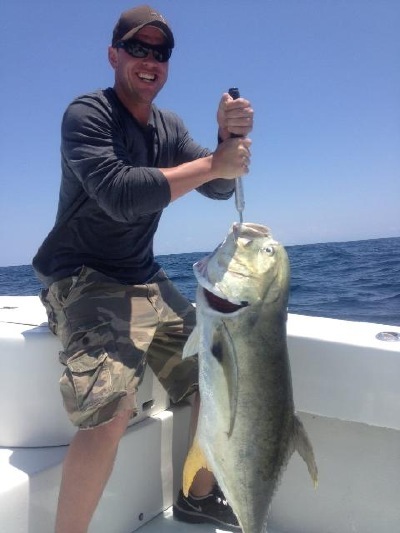 Great Bottom Fishing for Sea Bass and Triggers with a Citation Trigger at 5LBS!! Happy young men after catching Spanish and Blues!!! 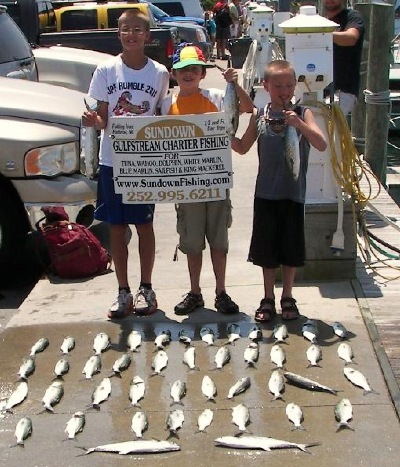 Father and Sons Great bottom fishing Sea Bass and Triggers on a slow day for Trolling!! Lots of color on this Mahi Mahi!! 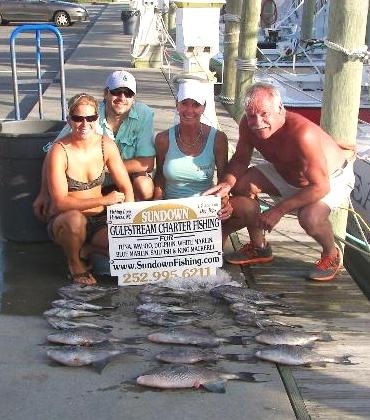 Tough crew on a sporty day 48 lb citation bull Dolphin!!! Spanish Fishing at its best. Limit of Spanish what a great day!! Fun day with a nice catch of Mahi Mahi!! 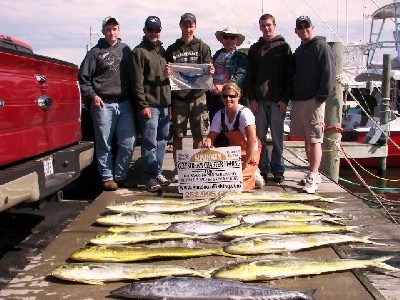 Limit of Mahi Mahi with a group of Fire Fighters and Medics from Hampton Newport News and Poquoson Va. !!! Nice catch of Mahi Mahi on a pretty day in the Stream!! 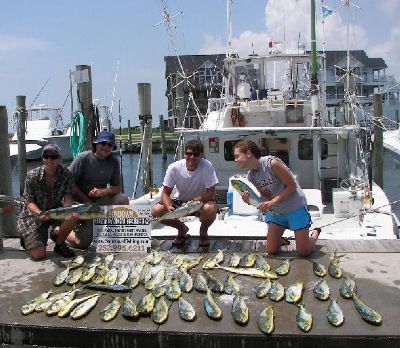 Limit of Mahi Mahi with a Great family on a beautiful day!! Great Spanish Fishing with a great crew!! 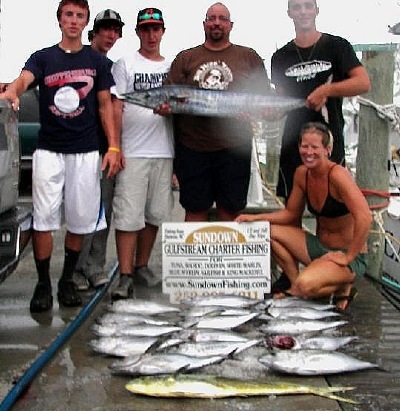 Big Blue Marlin caught by a 15 year old young man and great Mahi Mahi fishing with a limit!!! Capt. 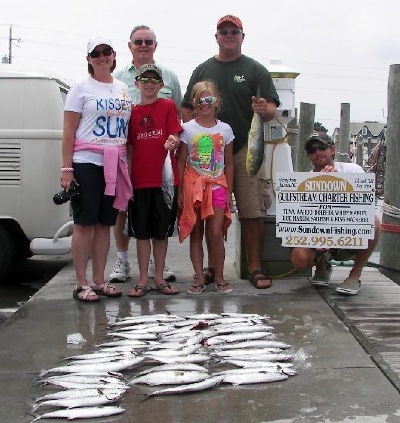 Terry and his Grand kids with a great day of Spanish fishing! 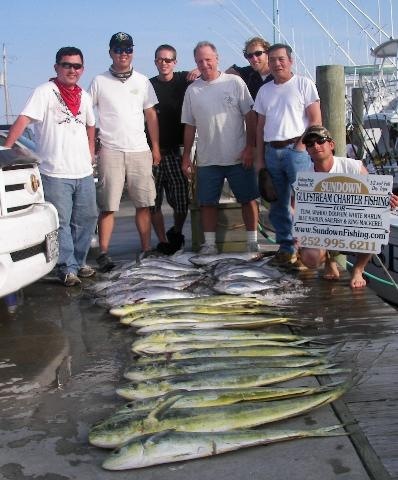 Super Mahi Mahi fishing with a limit of Gaffers and Bailers!! Great Dolphin fishing with a make up party! Nice catch of Mahi Mahi with a great crew! 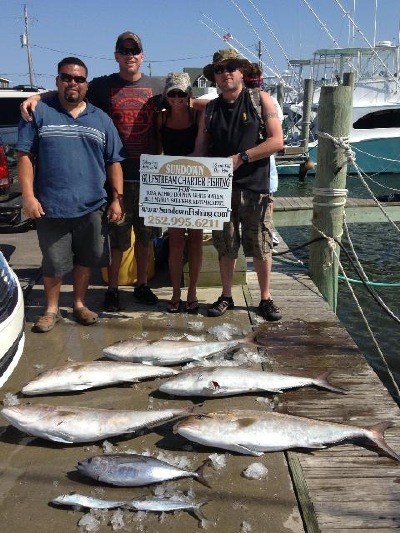 Lots of nice Spanish on a half day charter! Lots of Big Gaffer Dolphin on a sporty day with a great make up party!!! 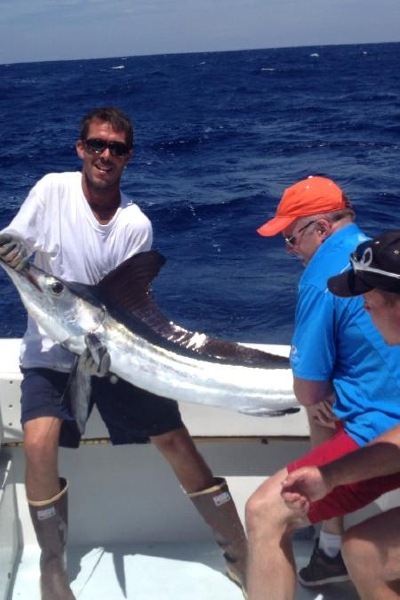 Big Gaffers,Wahoo and a Sailfish Release Great Fishing!! Good Spanish fishing with a mix of Sea bass and Trigger Fish! Nice catch of big Gaffer Dolphin! Good day with the Spanish and Blues! 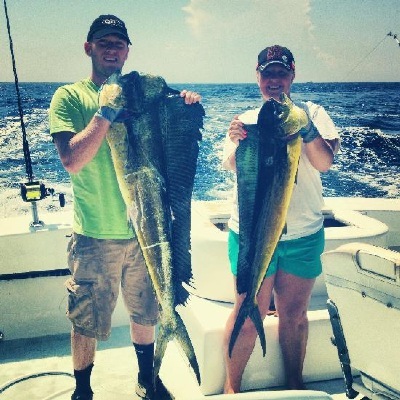 Great Mahi-Mahi fishing for this couple!! 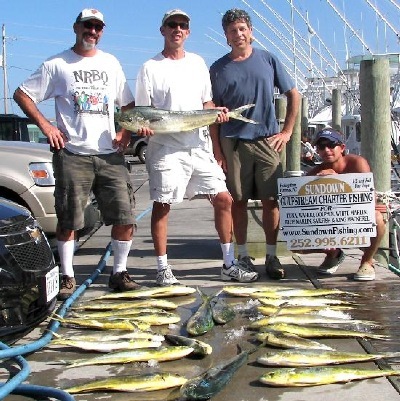 Great Mahi-Mahi and Black Fin Tuna Fishing!!! 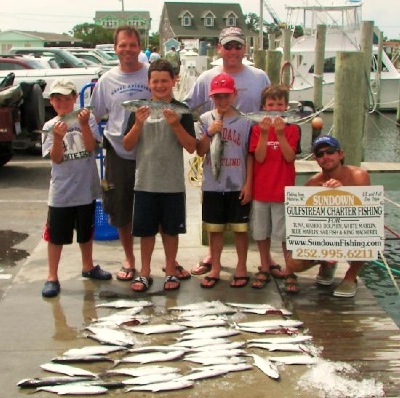 Great Mahi-Mahi fishing and a 71 lb wahoo caught by a tough 9year old! Wahoo's snapping!!! 59lb Citation great catch!! 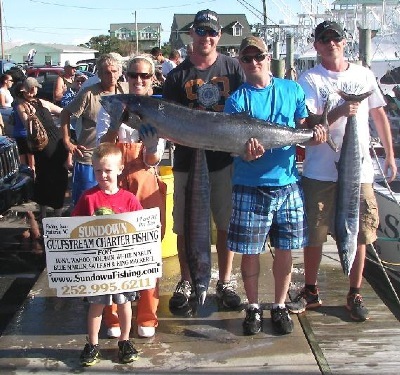 Great Wahoo fishing 53 pound citation on a sporty day! 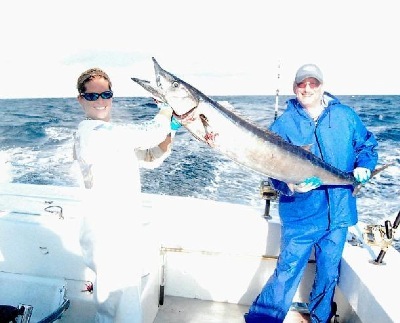 Wahoo fishing is great!! Two citations a 43lb and a 41lb good fishing. Great Day Offshore nice catch of Mahi-Mahi and Two out of Five Sails!! 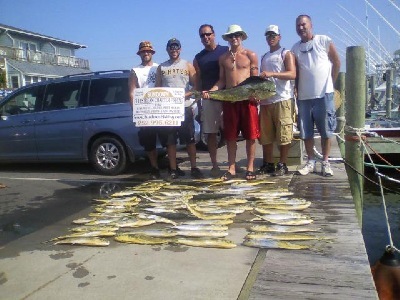 Limit of Mahi- Mahi on a weed line on a summer day!! Nice Cobia on the "SUNDOWN"
Great half day with a nice Cobia!! Beautiful day on the Ocean with Great Spanish fishing! Great catch of Mahi-Mahi on a calm day!!! 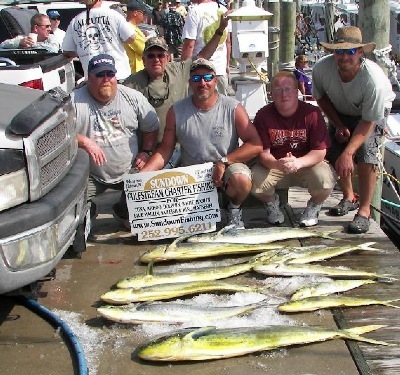 Limit of Mahi-Mahi on a salty day!!! 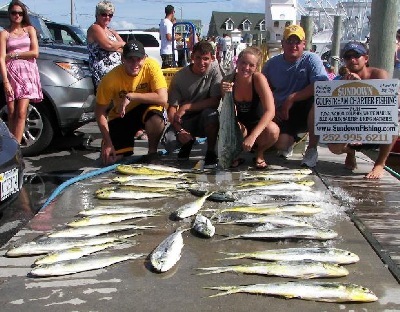 Good Mahi-Mahi fishing on a salty and sporty day!! 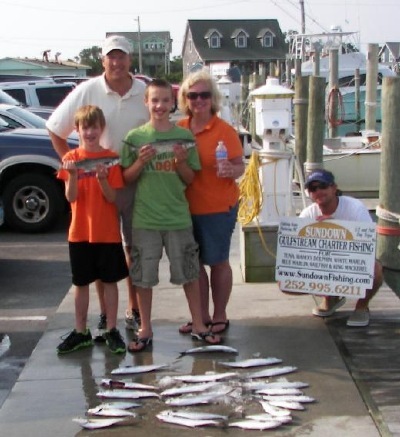 Family fun with Spanish fishing! 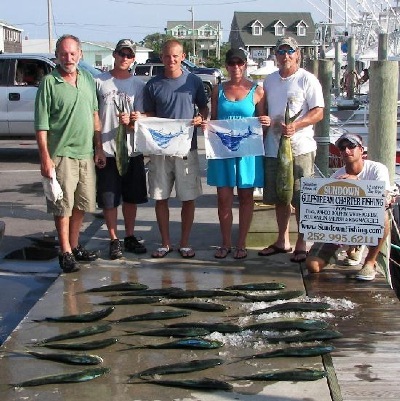 Great Bailer Mahi-Mahi- fishing around giant patches of grass!! Tough crew of young men! Great Spanish fishing on a sporty ocean!! Nice catch of Spanish for first time in the ocean! 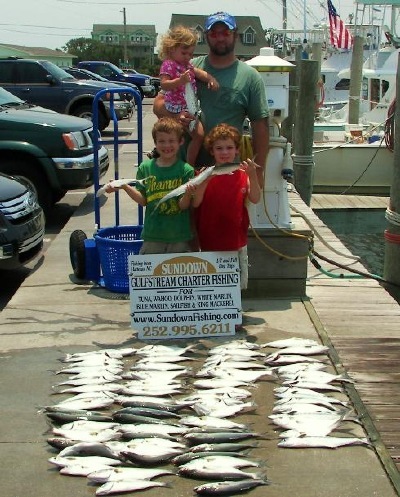 Capt.Terry's Grandsons Micah and Beckett and Granddaughter Emma with there Dad Adam back from a great day of Spanish and Blue fish on an inshore trip!! 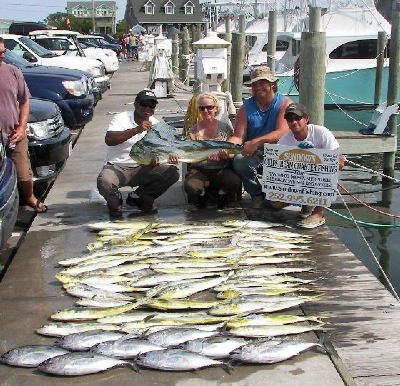 Great Mahi- Mahi fishing Black Fin Tuna's and a nice Yellow Fin Tuna on a calm day! A fun family day with one happy three year old, he fished and played all day!! 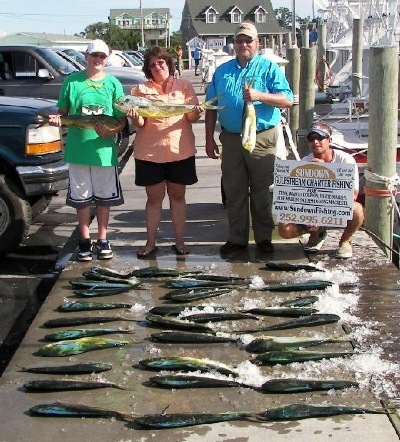 Great Mahi-Mahi fishing!! 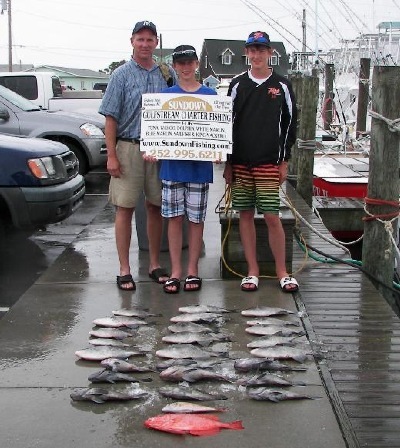 Dad and his two sons had excellent fishing! Gaffer and bailer Mahi-Mahi and one out of three Sailfish with a great makeup party! 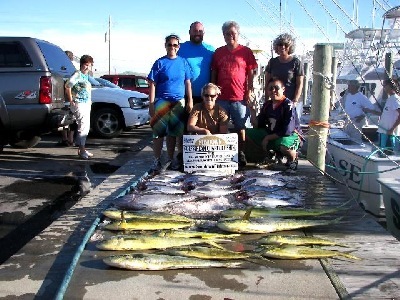 A great day of fishing Mahi-Mahi,Black fin Tuna and a Bill Fish!!! 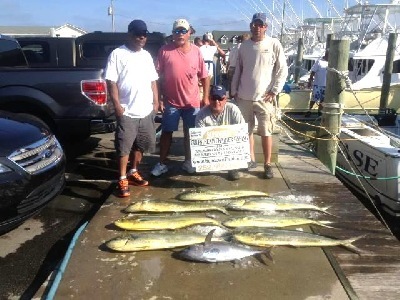 Fun day with a catch of Gaffers and Bailers Mahi-Mahi!! Fun Day of catching Spanish on a beautiful, calm ocean!!! 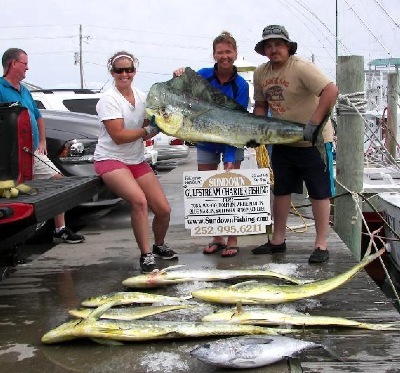 Great Mahi-Mahi fishing! Gaffers and Bailers! Nice catch of Mahi-Mahi and a AJ on a calm day! 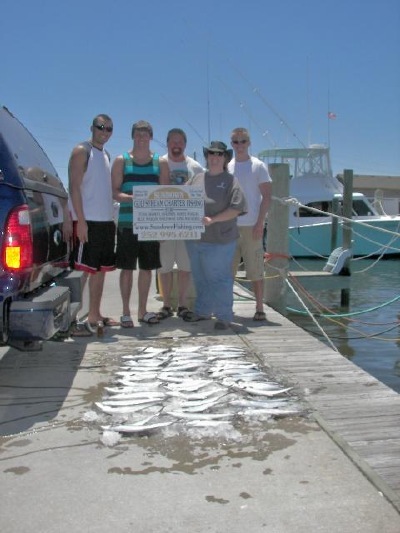 Awesome inshore trip Spanish and Bluefish!! 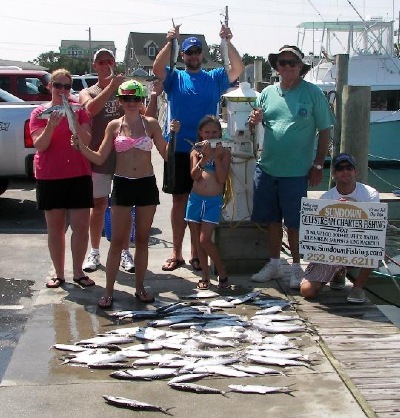 Great day of Blackfin Tuna, King mackeral and albacore fishing !! Nice catch of Spanish with some old friends! Nice catch of Mahi-Mahi , Blackfin Tuna and Albacore on a calm day!! Mahi-Mahi and Blackfin Tuna and released a 150 LB bull shark on a calm day!! Blackfin Tuna And Mahi-Mahi on a pretty day!! 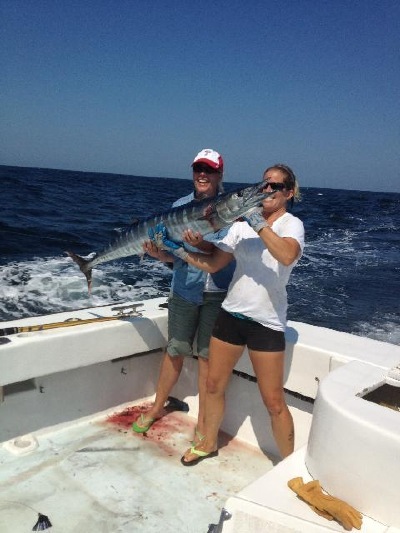 Mix catch with a nice wahoo!! Good Mahi Mahi fishing on a calm day!!! Great Half day fishing for Spanish and Blues !!! Great day of Black Fin tuna fishing with a Make Up Party!! XXLT ON A 50 PENN WHAT A FIGHT! Mom caught a nice one!! 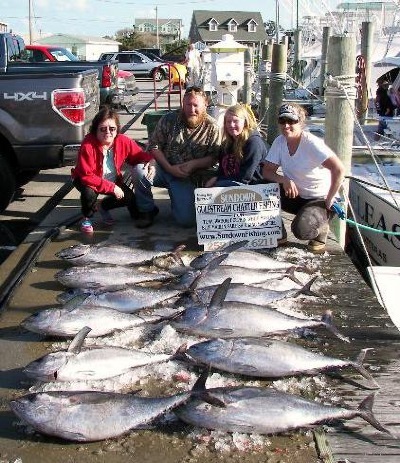 Good yellowfin and blackfin tuna fishing on a salty and sporty day! WATCH OUT HE'S ON THE GAFF!